We saw it earlier this week, but only showing up for 2 of our ~200 locations. Yeah. Seemed to be a tiny, quiet rollout, then BOOM. UPDATE: We’ve seen some of the descriptions showing up, but only in mobile and under the Menu tab. There are some weird formatting issues, with descriptions that fit within the character limits being cut off. And in one case, we see the descriptions showing publicly, but disappear in the GMB dashboard. Are you talking about the “Services” list (the name + price + section + description), or something else? Also, any screenshots you can share? Categories weren’t always the best match. Often they were too broad. So it’s good to see them going in this direction. Yeah. The categories list has always been odd. Too broad in some places, and way too specific in others. I see it for 2 out of 3 businesses – all in completely different verticals. I’m not seeing it in any of my UK locations, Phil. The categories list is inadequate so this sounds like an improvement. What types of businesses are those? I wonder if Google’s held back on certain industries. I personally manage 2 locations which I’m seeing them both on at the moment. It’s good to see more detailed options coming for GMB. This along with the description I think are great for communicating the value of a business without the need to even go to a website. Of course nothing will take the place of a good website but this is helpful also. Google giveth and Google taketh away. They’re trying to minimize the need to click on your site. Some sites are so anemic that Google truly will eliminate the need. 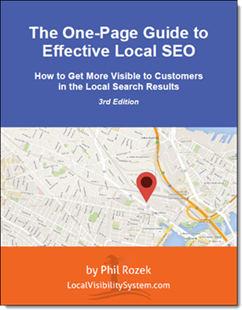 It may be a different story for sites that have more going on, perhaps for businesses that offer bigger-ticket services that customers really want to research. Phil–we’re seeing this across almost all our accounts in HVAC, solar, home performance, insulation, etc. We’re excited about it–for years, our sector of high performance energy efficiency contractors have not had appropriate categories. The big question, however, is where will this information appear? We’re seeing nothing in the KP so far. Could this really be only meta data? The “Services” show up in patches. In the Google Maps app the “Services” shows up under “Menu.” In a mobile browser the “Services” tab shows up, but nothing happens when you click on it. Nada on desktop at the moment. Thanks Phil. How goofy is that? A fork and knife “menu” link for an Air Conditioning Contractor that leads to services. Oy. Not seeing in mobile browser, btw, perhaps because we’ve been active with Posts and Q&A? Nope not yet. Not here where I am in sunny San Diego. I just checked and all I see is an “attributes” field to fill in…funny thing is, its self populated with only the words “+women led” as something that I can add, and nothing else. I hope it does hit my dashboard soon, I’d love to take advantage of that, if there is any. after I clicked once or twice on the women led word in that section, it turned green with a checkmark, click it again and a circle with a line thru it with women led in the center was next and looked like it would appear in the results. I really don’t like a subliminal stop signal on my listing so decided to go back to the option to not change it and leave it blank. But, yeah, the jury is out on the benefits of this thing. I should’ve updated this long ago, sorry about that Phil. Yeah, I started to fill it out when I seen that tab in the MOBILE BROWSER, which is a flippin pain in the backside. I HATE typing stuff on my phone, but I’m stuck with it until that voice dictation function actually works and makes sense of what I say. Its kinda funny google is making all of us do this on our phones instead of just typing with a keyboard. You can fill out “Services” on desktop. It’s just that it only shows publicly on mobile. Why don’t I see the “Services” tab on my pages? HVAC contractor, located in Florida. It should show up if you view your page in a mobile browser. It’s not showing up on desktop yet. 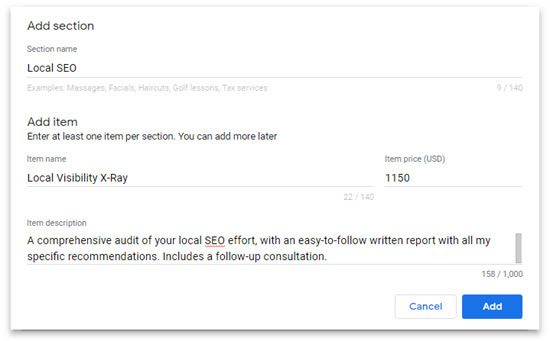 I have seen feedback from other marketers that by changing the category temporarily to one with the feature you want and then changing it back the feature might still be there. Could be worth a shot. Has anyone seen any boost in rankings from adding services? Does Google factor this in to SEPRs at all? 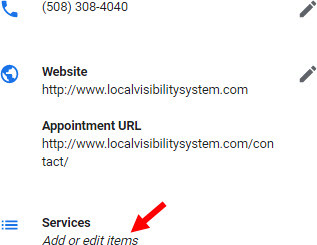 I haven’t seen a boost from “Services.” But it would be nigh impossible to notice one, because in any good local SEO campaign there is other dust flying and other variables (like competitors) swirling around. Other people might have noticed a difference, though.